Les Sages Fous propose a theatre of paradoxes: grotesque and poetic, ritual and mudane, domestic and marvelous. 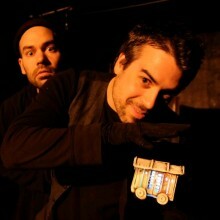 The company recreates a lost world where the mask, the puppet, the object, and the human coexist. A theatre where images and gestures speak more strongly than words. A theatre that is as surprising and disturbing as it is wild and undisciplined. Les Sages Fous sont en ville!